Eskhaton are an Australian death metal band and this is their third album. Now that’s a death metal album cover. I could look at the artwork for this for ages. You may remember Eskhaton from their chaotically brutal 2014 album Worship Death. Much like that album, Omegalitheos continues to deliver the band’s savage, relentless, and bestial sound. The intervening years between releases has seen Eskhaton stock up on their material, and this new release is a hefty 55 minutes long. Where to start with an album as dense and as uncompromising as this? This is extreme music, with a whirlwind sound like that of a violently churning maelstrom. For most this will undoubtedly be too impenetrable and off-putting; Eskhaton use death metal as a medium for chaotic noise and bestial mayhem, while also including complex technicality and esoteric dissonance. The band create nightmarescapes of horror and blastbeats. The songs are harsh and unforgiving, creating layered, textured atmosphere through sheer violence and extremity. There’s nothing nice or pleasant about this album, and the textures and atmospheres I mention are not accessible or friendly in any way. There’s not much in the way of traditional structures, hooks, or obvious riffs on this album. If these are the kind of things you look for in death metal, then move along now. Eskhaton are all about violence, chaos, intensity, and bestial wrath. 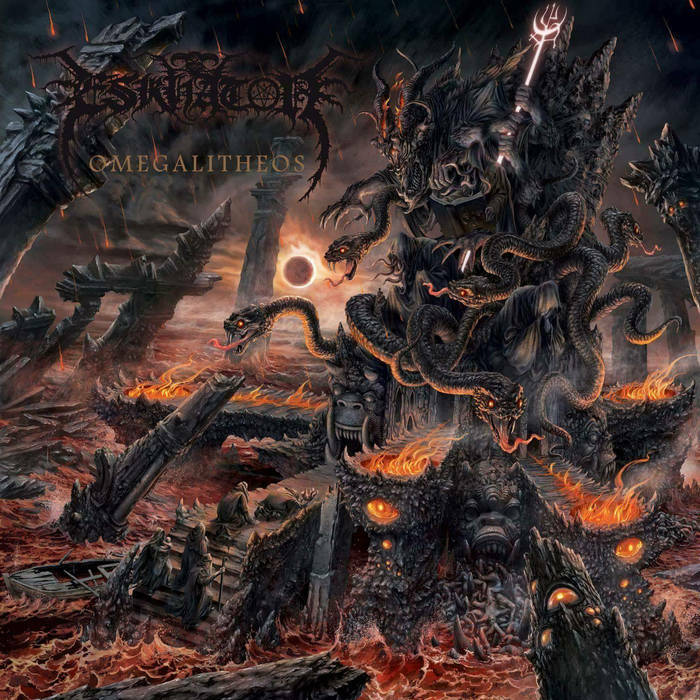 Omegalitheos is a raw and unrepentant take on death metal madness, and the band do what they do very well indeed. Do you think you have what it takes to worship death as fully as Eskhaton do? Yes? Then give this album your undivided attention and prepare for the apocalypse that it surely must herald. This entry was posted in Death Metal and tagged Death Metal, Eskhaton, Metal. Bookmark the permalink.